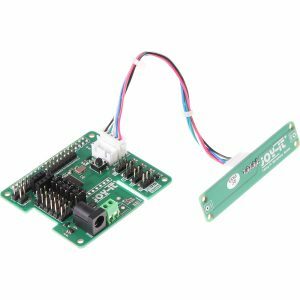 The module, now available from Conrad Business Supplies, serves as an extension to Raspberry Pi, allows the control of lights, individual sockets or devices by voice command. A bracket holds 433MHz radio modules which, together with the integrated motor control, can extend range “significantly” says the company. It is possible to address devices and circuits via Raspberry Pi’s GPIO interface for a selection of applications. There is a six-channel servo PWM control for robots or robot arms. Jumpers can be used to make the module switchable between GPIO and an additional servo PWM unit. A stereo microphone is on an additional board and the integrated I2S sound output driver allows connection of a 3W speaker. The company has also announced that it will soon release and an additional module to connect another speaker for stereo sound output. For servo motors, an integrated 5V barrel connector is available. The module measures 64x10x54mm for installation in space-sensitive areas such as enclosures as well as integrating into existing applications.